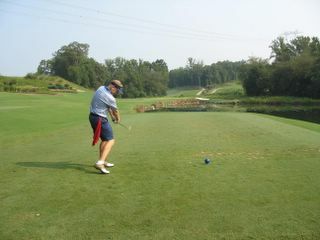 I played from the blue tees (6600 yds) and shot 83. Shooting a 37 on the front was sweet, but blowing up on the back with a 46 wasn't. Today I was reminded that the game is 99% mental. Props go out to my buddy John who took this great picture! Props also go out to our new friend Mark who joined us as a single. He helped point out the nuances of the course that I'd forgotten about over the years.